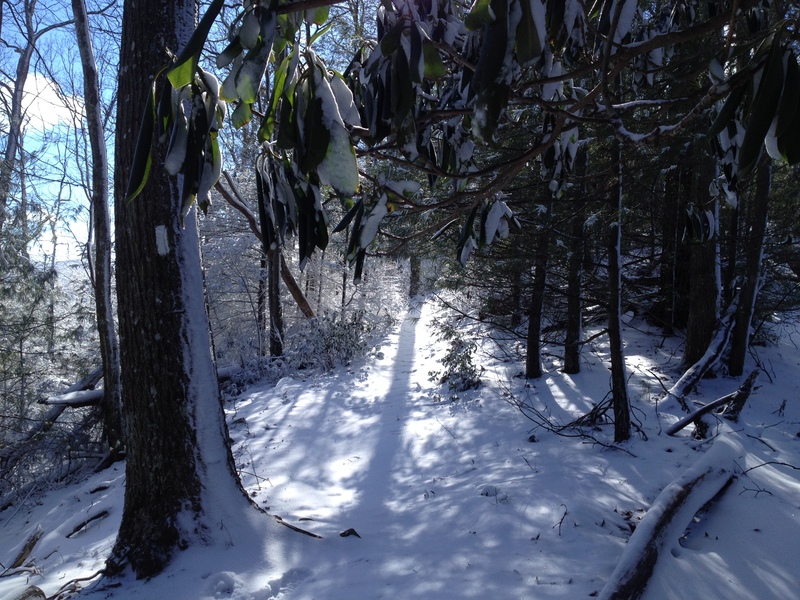 The range of winter weather in the southern Appalachian Trail and mountains ranges from pleasantly mild to bitter cold with heavy snow. 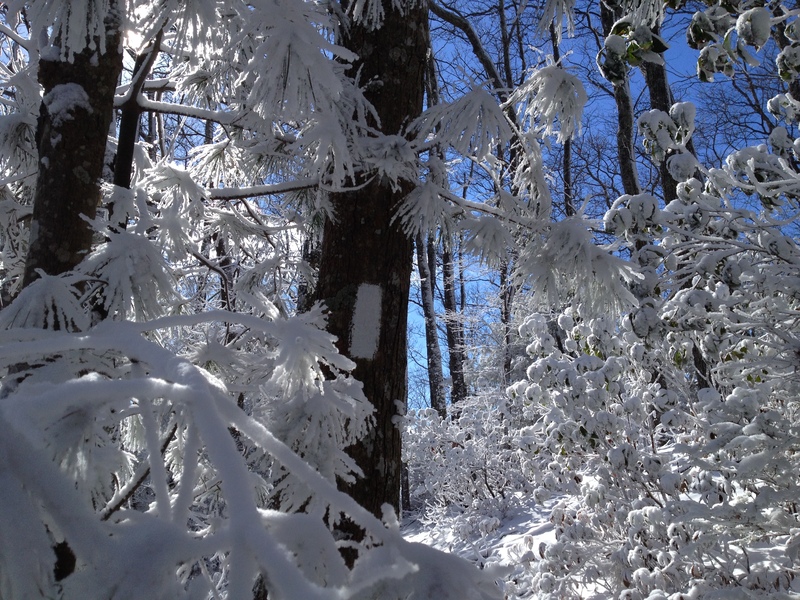 The Great Smoky Mountain National Park is both noted as the home of the highest peak east of the Mississippi (Clingman’s Dome – 6,643 ft.) but probably more so for its terrible winter weather. Just this week a group of ill-prepared hikers required rescue from the cold and snow. http://www.weather.com/video/hikers-rescued-in-snowstorm-42994? With facts like these in mind, I re-evaluated my winter kit over the holidays. When I left the trail to celebrate Christmas with my family, my basic sleeping system, due to my distance runner’s stature, was based on a woman’s Sierra Designs woman’s dry down 25 degree bag supplemented by “puffy” down booties, pants and two down jackets sized to fit inside one another. I am a warm sleeper and reasoned that the sleeping bag was good to at least 20 degrees F in my case. With the booties, pants and jackets I figured that I could get to -10 F comfortably. A zero degree night of borderline comfort proved me wrong. So, I resurrected my zero degree 70’s vintage, but weighty, Holubar sleeping bag . Holubar was bought by North Face decades ago, for the record. Please don’t misunderstand. I adore winter hiking and camping. To be redundant, it’s unique and there’s nothing like it. To be selfish, this week I spent four days on the AT and guess how many other hikers I saw? Zero! The AT was mine alone for that time. Not a human track anywhere. I enjoy company on the trail, but those who have thru hiked during the crowded traditional hiker season may appreciate what it means to have the trail and the woods, not to mention every shelter and privy all to one’s self. It’s an amazing experience and privileged access to a treasured public accommodation not to be lightly dismissed. When I hit the trail on Tuesday, I knew that the weather forecast for Thursday and Friday was ominous. As I ‘misunderstood’ it, the chance of rain on Thursday was 40 percent with an 80 percent chance of snow on Friday. The bottom was supposed to drop out of the thermometer Friday night. I was only slightly off. Knowing it “might” rain on Thursday, January 2, I prepared appropriately. When I bounded away from Thomas Knob Shelter, I was ‘armored up’ in rain gear including waterproof mitten shells and my new (and third) pack cover was battened down with a cat 5 hurricane in mind. What foresight, if I do say so myself. Ever seen a cow urinate on a flat rock? That’s how the rain let loose about five steps after I jumped out of the shelter door! Bam!!! I was swimming in the soup. The volume varied, but the precipitation didn’t let up all day as my boots squished steadily southward across White Top Mountain in the direction of Damascus. The going was slow. Here’s the good news and bad news. First the bad. The temperature all day hovered around 32 degrees. The ground remained frozen. As proof, I nearly crashed and burned crossing a gravel parking lot glazed with a hidden layer of slick black ice. On the positive side, my rain gear and base layer did their jobs. I arrived in camp in very good shape considering. I had hoped for a 24 mile day. If I could do that, I’d be in Damascus by noon Friday and home Friday evening. That was not to be. Oh well, flexibility is a key to happy hiking. At 4:30 p.m. I made Lost Mountain Shelter. The temp was dropping and the rain was just beginning to mix with snow. With my quota still six miles away, I realized that I’d be night hiking yet again. This time with early darkness caused by the cloud cover, it would mean almost three murky hours in sleet and snow. The decision to stop for the night was a no-brainer. I was fatigued from the previous two tough days. Given the day’s rain volume, who knows how heavy the snow might become. Headlamps penetrate snow no better than car headlights see through fog. The trail bed was icy in spots. Check dams can form frozen skating rinks in winter. Not safe. Time to check my ambition at the door and brake for sanity. Good decision. The shelter was clean and in good repair with convenient amenities thanks to the local trail club volunteers. The spring and privy were handy. The setting was aesthetically pleasing. It doesn’t get better than that on the AT. It also was nice to have extra time to settle in. I wouldn’t have to cook or set up my bedroll by headlamp. As the curtain of darkness smothered the landscape, my appetite was satiated and I rolled into my sleeping bag. It was around 6 p.m. Hiker midnight is a relative condition… set at any time you want if you’re solo. Since the previous two nights bottomed out in the low 20s, I expected the trend to continue because my understanding was that the super cold would arrive overnight on Friday. By then I could now anticipate being comfortably ensconced once again at Crazy Larry’s. Accordingly I chose to wear fewer layers and not don my down pants or booties. I did, as I habitually do, tuck into bed with me a liter of water, a butane canister and a pair of mittens. Since it was time to change socks, I put on fresh liners and socks. I fell asleep almost immediately. When I winked out, rain drops were still tapping the shelter’s tin roof. In time nature called. Without glasses I glanced at my watch. I thought it read 5:30 a.m. I felt like I’d slept through the night. That would be a record. As I parked my glasses on my nose to confirm the time, I realized it was only 9:30 p.m. Oops! Ever imagined what sleeping next to a thousand-car freight train at full speed sounds like? That thought jerked me awake around 11:15 p.m. as the wind howled and trees cracked and groaned. Thank you Benton MacKaye for imagining shelters built like military bunkers. The snow was swirling like icy diamond dust as it sprinkled my face with surrealistic pin pricks. I cinched down the opening to my sleeping bag to the size of grapefruit. My nose was colder than I could remember it being for a long time, yet my body was toasty. Back to sleep. The wind kept blasting away. Falling branches and trees served as multiple alarm clocks trough the night. My exposed nose-o-meter sensed remarkably lower temperatures. What layers should I wear tomorrow if this continues, I worried? That the next day’s destination, 18.5 miles away, was Damascus was the saving grace. With that in mind, I reasoned I could gut through most anything. A sudden silence awakened me around 5:30 a.m. The driving wind stopped like Mother Nature flipped a switch. Check. The front moved on. One problem solved. Extreme wind chill was out of the wardrobe and safety equation. Amen! Knowing I had big miles to go, I was up and moving well before six. As I stumbled to the privy in rock hard boots, the light powdery snow squeaked and crunched. Oh oh. It’s colder than I thought. Snow doesn’t make that sound unless it’s 10 F or colder. The thermometer on my pack read -15 F. The bottom had fallen out a day earlier than I expected. In spite of all that, I was comfortable through the night without the benefit of my full kit. The added tonnage on my back paid its dividend. Think about it. At 4:30 p.m. the previous evening, the rain had soaked all my exposed equipment. My pack straps, nylon webbing, including my trekking poles, had been thoroughly dunked. How about my rain jacket and rain cover? Oh boy! I’d hung my gear up in hopes that dripping and some evaporation would occur before everything froze. As every professional manager knows, hope is not a method. By morning everything was crunchy to say the least. What an understatement. This is the worst case scenario that I have seriously worried about since contemplating a thru hike. What happens when hikers get soaked right before the temperature crashes to a dangerous level? At -15 F, skin freezes on contact with any material that rapidly conducts heat. Frostbite and hypothermia are clear and present dangers. You can be serious trouble before you even know it. Fortunately I have profited from previous soakings. In those cases, luckily timed town stops saved my bacon as I slopped thoroughly waterlogged beyond imagination into Erwin, Tenn. and Damascus, Va. This time, the cargo compartment of my pack was dry inside and out. The base layer I was wearing dried out because it was only damp with sweat. The waterproof mitten shells worked. For redundancy’s sake, back up gloves, mittens, socks and a base layer were in the ready rack if need be. When it is seriously cold, everything takes at least twice as long. After unzipping my sleeping bag, I slipped on my glove liners; then my mittens. You never want bare skin to touch anything. When I needed dexterity to stuff cargo sacks or manipulate zippers and the like, I took off the mittens. When the task was complete I jammed my hands back into the mittens until they warmed up again. Only then did I attempt the next task. The valve on my NeoAir was frozen shut. Why not? Breath is full of water vapor. Only bare hands could wrench it open. That smarted. Fortunately, I always loosen the laces on my boots before bed. If I had known just how cold it would get, I would have put them inside my sleeping bag. Thanks to the thick dry socks, my feet never got cold in spite of wearing icy boots. Walking saved the day. Gaiters kept the snow off my socks and out of my boots. The snap, crackle and pop sounds of Rice Crispies echoed off the walls as I struggled into my gear. Had you been there, you would have had to pardon my occasional “french” expletives. The shelter faded behind me around 8:30 a.m. Not bad considering. As the day unfolded, body heat thawed the equipment, the straps loosened, and everything ultimately began to fit properly. The day’s high hovered around 5 above. My water bottle even got slushy inside my jacket. That NEVER happened at -20 in northern Minnesota! I had different and a heavier outer layer then which may account for the difference. The day and trail itself were awesome. Brilliant sun reflected off a snow frosted landscape. The tracks on the pristine path read like a story book with Br’er Rabbit and his pals eluding foxes and bobcats. Wild boar and deer made their separate grocery shopping trips. Guess what? No bear tracks. That was a surprise. I’m home now in preparation to fly with my daughter to Colorado on family matters. I can’t wait to get back on the trail. As for future weather? We’ll see. The last picture is telling. Safe travels. See you back on the trail. Your comment about having the place to yourself during winter hikes is so true. We appreciated that fact on several of our recent hikes. The descriptions of the cold and frozen gear and clothes gave me chills. We are at 8˚ here this afternoon and headed for -20˚ and -17˚ the next two mornings. I won’t go out until maybe Weds. Stay safe. Thanks for the post. I don’t miss upper Midwestern weather. Stay warm. I saw the video about the hikers needing rescue while it was still posted. Those guys were in waaaaaay over their heads and were ill prepared for bad weather in the backcountry. I also question their decision making. Why would you burn clothes to stay warm? Why not just put them on? My 12-year-old son, who backpacked the AT through the Smokies with me last summer, saw that they brought a blowtorch to light fires, and said “Dad, that would be heavy”. Yep, heavy indeed. 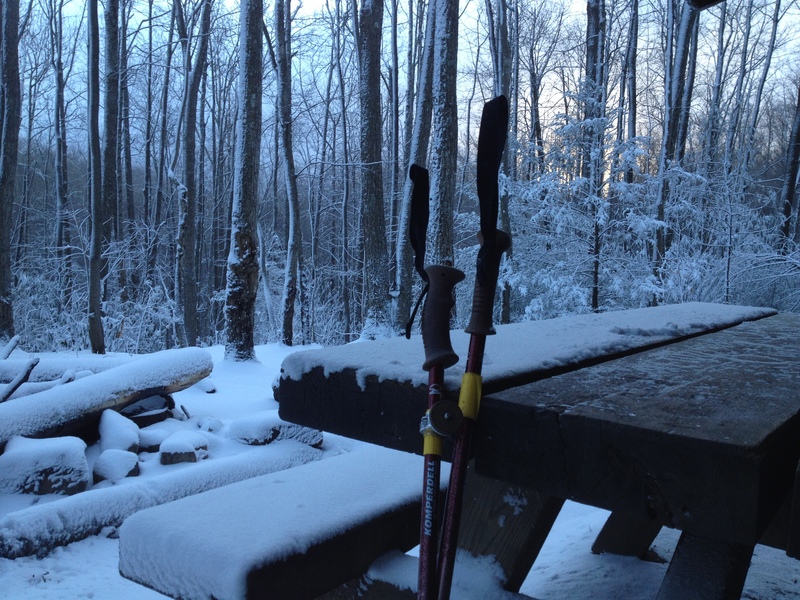 Bottom line is if you are prepared, the Smokies are survivable any time of year. Winter and early spring are somewhat challenging, but like you saw in your last hike, they can be beautiful. Good luck with your hike. You are so right. Knowhow and experience are priceless. Moreover the difference between equipment that you absolutely need and that which nice to have is enormous. As soon as I finish settling my mother’s affairs, I’ll be back out there. Jim: do you live in CO or VA? And do you know a Bill Mulvey, US Army Retired? I served with Bill Mulvey in the Army for many years off and on. I live in the Washington area Maryland burbs. My extended family lives in Colorado. My mother was terminally ill which accounts for my travel and time off the trail. Sorry for the confusion.